Not all weddings have to have a giant wedding cake, particularly if the bride and groom are not partial to a slice or two themselves. Perhaps you would prefer to go for a healthier option of a stunning fruit fountain! With its delicious aroma and flavours, the fruit fountain will definitely be a talking point of your wedding day and will delight your guests with the varieties you can choose from. 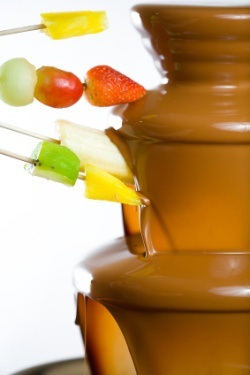 Perhaps you prefer a chocolate fountain where you can have the fruit served around it which enables your guests to dip their favourite fruit into the flowing warm chocolate. The great thing about fruit fountains, apart from their taste of course, is that you can even co-ordinate the fruits to mix in with your wedding theme. You could have smaller versions around the room or even have a small display as your individual table decorations. Picking your centrepiece is a difficult choice so you should think carefully about what you want and how you want it displayed. 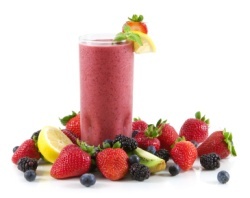 Like the drink and chocolate fountains, you should be able to hire a fruit fountain. It could be arranged and displayed in conjunction with your theme, for instance a Hawaiian wedding could include a fruit fountain in the shape of a palm tree or a castle shaped fruit display could complete your fairytale wedding theme. Check the reputation of your supplier beforehand, ask for any feedback they have received from previous customers or even look online and see if they have a website or review page. You should be on the look out for reviews regarding how professional their staff are, are they reliable, what their hygiene standards are like and of course, how good their products are. Whoever you choose as your supplier, they should provide you with the necessary stands and of course the fruit which should be at it's freshest. Your fruit fountain may arrive fully stocked and prepared or they may need to gain access to your reception room to prepare it before your guests arrive. Be sure to check with your venue if this is possible, or if they have somewhere that they can store the fountain securely if it arrives already built. As well as the fruit, your supplier should also include such things as the sticks your guests will need; any dips that you have chosen, napkins if requested and even an assistant who can help your guests or provide further fruit and dips throughout the evening. They should also, at the end of the evening, return to dismantle the fountain with minimum fuss and mess. Do It Yourself Fruit Fountain? You can of course try and arrange your own fruit fountain. This will definitely give your big day a personal touch but there is a lot of organising and preparation involved in setting up such a fountain. You would have to obviously buy the fruit which you would need to do only a day or two before your wedding to ensure that the fruit is not overripe. 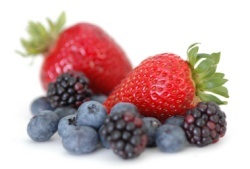 This would also mean that you would need to ensure that your supplier has only just received the fruit themselves so that it is at its freshest when you collect it. Ask yourself if you have the time and the energy to perform this task and of course, will you have enough time on the morning of your wedding day for the final touches? Would it work out cheaper to hire one from a reputable supplier instead of spending money on your practise runs in the lead up to your day, remembering of course that if it goes wrong on the day that you wont have a back up whereas a professional should always be prepared for any minor mishaps. If this is something that you are interested in achieving yourself, don't be afraid to ask for help with the preparation and ensure you get lots of practice. Start out by practising on producing smaller versions and gain some confidence in your ability before moving onto a larger display. Whatever your choice of fruit or display, your fruit fountain will be one to remember!